The Elmhurst Lions Club is getting ready for their Reverse Raffle Fundraiser. The event will be held on at the Knights of Columbus Hall, 537 S. York, Elmhurst. This will be the 13th year for the raffle. Only 200 tickets will be sold for the raffle, and we expect a large crowd on hand to take part in the event. The Raffle is unique in that a long as your number was not called you have a chance to be the big winner. 25 prizes will be given out throughout the event, including one for every 10 tickets drawn, but by far the best time of the evening is when only 10 tickets remain. The final 10 have of the option of splitting the grand prize ($2000) or holding out to see if they could make it to the final ticket drawn. It is very exciting as one-by-one people are eliminated, there might even be some good spirited bidding to buy the remaining tickets. We also draw two $100 consolation prizes at the end of the evening!! All net proceeds raised, roughly $4,000, from the raffle will be donated to the Elmhurst Memorial Healthcare Learning Center for Diabetes. The Learning Center for Diabetes is officially recognized by the American Diabetes Association and has received the Joint Commission's Advanced Certification of Distinction for Inpatient Diabetes Care. Elmhurst Memorial Healthcare is one of only two organizations in the state to receive this certification. Lions are known as "knights of the blind," focusing on programs and projects that serve the blind or visually impaired, or aim to eliminate preventable and reversible blindness. But we also participate in other health programs and projects. Lions support local and large-scale efforts to control and prevent diabetes and diabetic retinopathy, the leading cause of vision loss in adults of working age in industrialized countries. Raising Awareness, Preserving Sight: The World Health Organization estimates that 246 million people worldwide have diabetes, a global epidemic that is expected to affect 380 million by 2025. Diabetes and Sight Loss: People with diabetes are at risk of losing sight due to diabetic retinopathy. Approximately two percent of all people who have had diabetes for 15 years become blind, while about 10 percent develop a severe visual impairment. There are risk factors around diabetes and eyesight. For instance, evidence indicates high blood pressure and smoking may worsen diabetic eye disease. Lions and Diabetes Awareness: With these statistics and concerns in mind, Lions adopted diabetes awareness as a long-term commitment. Our work supports diabetes education, treatment, research and early detection. A screening test can detect diabetes. Lions clubs often arrange for free diabetes screenings in their communities. Together we can make a difference that lasts a lifetime. 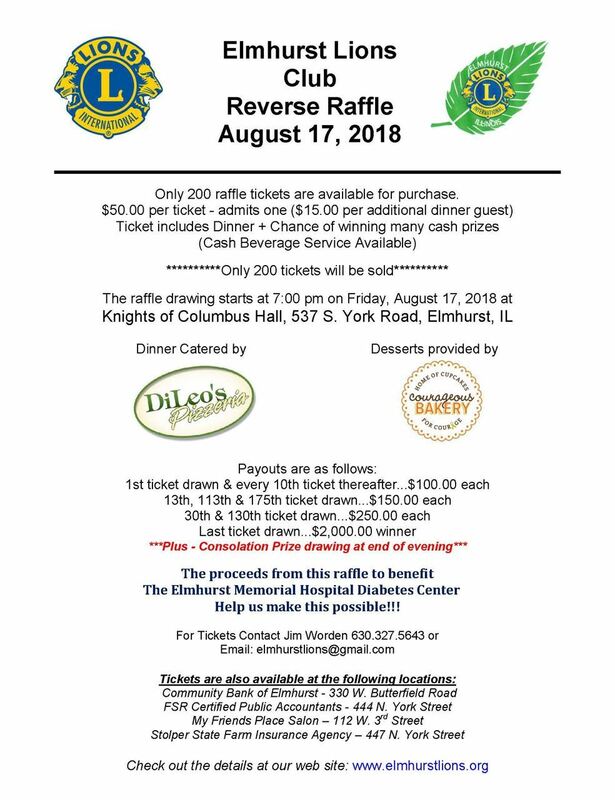 The Elmhurst Lions Club would like to thank all those people, individuals and business alike that throughout the years have supported our mission, and thank you for making our Reverse Raffle such a great success.